Michael Brook (born 1952 in Toronto, Ontario, Canada) is a Canadian guitarist, inventor, producer, and film music composer familiar with many disciplines including rock, minimalism and film scores. Along with Brian Eno, Brook is considered a founder of the ambient music movement. In the 70's he worked as an engineer with Daniel Lanois and played guitar with the band Martha & the Muffins. Later, he was introduced to Brian Eno and played on Eno's production of Fourth World, Vol. 1: Possible Musics, by Jon Hassell. In the 70's he worked as an engineer with Daniel Lanois and played guitar with the band Martha & the Muffins. Later, he was introduced to Brian Eno and played on Eno's production of Fourth World, Vol. 1: Possible Musics, by Jon Hassell. 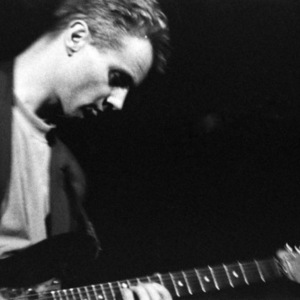 He is most famous perhaps for his sonic contribution to U2's multimillion-selling 1987 album The Joshua Tree in the form of his invention, the Infinite guitar; he is also known for Peter Murphy's 1995 album Cascade. Brook is a specialist in timbre and texture. He was nominated for a Grammy Award in 1996 for his production work on Pakistani singer Nusrat Fateh Ali Khan's album Night Song. He is also known for many other contributions including the album Sleeps With Fishes which he made in 1985 with singer Pieter Nooten and his effortlessly crafted solo masterpiece 1992's Cobalt Blue. A new solo album was due out in mid-2006. Brook toured as a member of the Sylvian & Fripp tour group, with the final concert at the Royal Albert Hall in December 1994 documented on the album Damage. He also opened the concerts with a solo set, featuring the Infinite Guitar with effects and sequencer backing. He has produced albums for Julia Fordham, Jane Siberry, U. Srinivas, Youssou N'Dour, The Edge, Balloon, and others. Brook has also written for a number of film soundtracks including the music for Albino Alligator, Mission: Impossible II and the new Al Gore documentary "An Inconvenient Truth".